Since 2008, the Mildred Goetz Day Camp in Pearl River has been offering a petting zoo to the enjoyment and delight of all the campers. 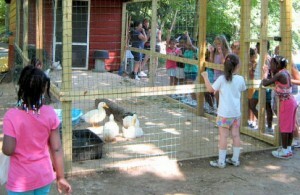 With cows, goats, chickens, ducks and pigs, the zoo has a range of tame animals that live at the campgrounds all the summer long. A highlight of the campers’ week is their scheduled time at the petting zoo, where they get to visit, watch, feed and, of course, pet the animals. 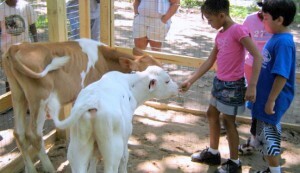 The menagerie of cows, ducks, pigs, chickens and goats come to us through an arrangement with a farm in Budd Lake, NJ and are cared for by our skilled and nurturing summer staff from Australia and England brought on board through the Camp America international staffing program.